Over the years I have had the good fortune to fly fish many waters across North America. As British Columbia resident for over 20 years I thought I had a pretty good idea of what prey items trout favoured, particularly in stillwaters. Since sliding east over the Rockies a number of my conceptions have changed. Backswimmers for example, so named for their preference to swim on their backs and view the world upside down are present in many British Columbia lakes but tend to be a rare food item. However, when exploring the lakes, streams and rivers of Alberta, Saskatchewan and Manitoba the tune changes. Back swimmers are often a favoured prey item, especially during the late summer and fall periods. Belonging to the order Hemiptera or water bugs, backswimmer species number just over 30 across North America where they inhabit lakes, ponds and slower stretches of rivers and streams. Their species numbers are considerably less than their water boatman cousins backswimmers are often confused with. Each year I conduct a series of seminars. One contains a backswimmer image. I make a point of quizzing my audience as to the subject’s identity. Without fail, over 80% mistake the backswimmer for their smaller boatman relatives. Proper identification is important both from pattern/presentation perspective but one of safety as well. Capable carnivores, backswimmers can inflict a nasty bite on a pain level similar to that of a wasp. Throughout their incomplete 1 year life cycle backswimmers are always in a state of growth flux. Depending upon the season backswimmers range from ¼" to 5/8" and are best imitated on standard shank hooks, sizes #8 through #12. Larger backswimmer size is one key water boatman separator. 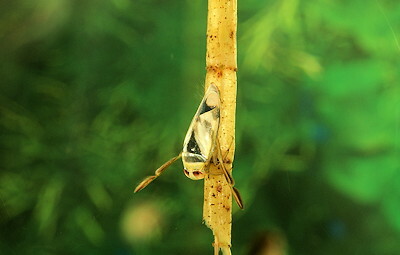 Backswimmer life cycles consist of 5 instars averaging approximately 1-2 weeks between moults. Reaching maturity in the late fall or early spring backswimmers survive the winter months by hibernating in the bottom substrate or darting between the many air pockets beneath the ice cap. Backswimmer hind legs are long, articulated and oar-like, their tips covered with tiny hairs aiding propulsion. 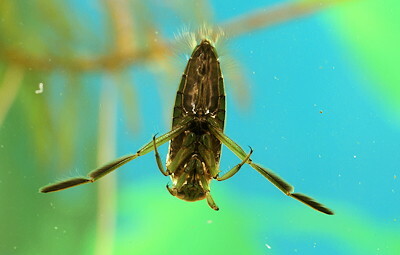 The legs and the confident sculling motion backswimmers use to propel themselves through the water are another reason they are often mistaken for water boatman. Large caddis pupa can also be confused at first glance with backswimmers for the same reason. Each species has their own unique swimming motion and pace depending upon their food preferences. Faster more agile species are able to overpower swifter prey such as water boatman while slower species must settle for slower meals. Mother Nature’s way of ensuring over grazing does not take place and the delicate predator prey balance remains intact. The raptorial clawed front legs are sometimes held out in front when at rest giving them an antenna like appearance. Front leg size varies amongst species depending upon their favoured prey. Backswimmer species with longer front legs are able to tackle and overcome larger prey such as small minnows and damsel nymphs. Backswimmers have an oval teardrop profile featuring a rounded head and tapered abdomen. Careful underbody construction helps backswimmer patterns mimic this natural shape but is not needed in most instances. A closer inspection of the tapered end of a backswimmer reveals tufts of fine body hairs. These hairs are used to penetrate the water’s surface to breathe and gather the bubble of air these insects need to survive and prowl beneath the shallow weedy regions they prefer to inhabit. A tuft of Midge Gill or Antron imitates these fine hairs nicely. At rest backswimmer’s hind rowing legs are held in a swept forward fashion and imitations should adopt this posture. The round rubber and stretch floss legs common to most backswimmer patterns kick and work better when tied in this swept forward position. Backswimmers prefer to hang at the surface like a dozing bat, swooping from above to ambush unsuspecting prey. Located on their underside is a long tapered mouth used to pierce prey. This is the tip of the sword careless anglers feel when mishandling backswimmers. Give backswimmers respect, use a small aquarium net whenever sampling or examining them. Backswimmers inject an enzyme into their victims transforming their body tissue into a digestible liquid. Once finished, the carcass is discarded. Favoured backswimmer fodder includes mosquito larvae and their smaller boatman cousins. Clutching the boatman against their chest and underside in an almost affectionate embrace backswimmers vacuum out their relatives insides in short order. In addition to size color, or at least it order, is another key backswimmer water boatman identifier. Backswimmers feature white to tan backs marbled with darker almost wine glass shaped markings and olive to dark olive ventral surfaces, opposite to the smaller water boatman which feature dark backs and light bellies. Size 10 or 12 Prince Nymphs make excellent backswimmer imitations either in their original or newer beadhead forms. Backswimmer heads are often light olive with a pair of prominent red eyes. Immature backswimmers are often all white with distinct segments down their backs. I use red thread on my backswimmer patterns to suggest the eyes. Patterns using foam bodies or shellback can have eyes dotted using a red marker. Backswimmer legs are often the same colors as their lighter backs. The light backs on mature backswimmers are actually wings folded neatly down their backs. 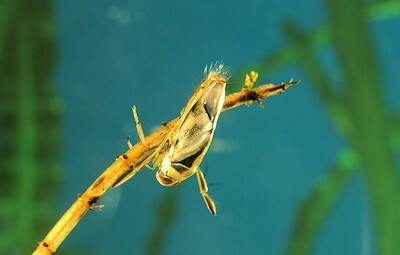 Only after the final instar can backswimmers take flight, which they often do in the late summer and fall to mate and populate new bodies of water. Flying backswimmers look like large white beetles as they whiz by during these mating and migration flights. When returning to the water they crash through the surface film like raindrops. Foraging trout key into this distinct plop, allowing backswimmer imitations to land in the same manner can be rewarded with confident cork jarring strikes. On moonlit nights backswimmers take flight searching for the reflection of new waters to inhabit. Street lights take a terrible toll on these night fliers. I have experienced reliable backswimmer fishing well into the evening, casting buoyant patterns towards the sounds and swirls of foraging trout. Egg laden backswimmers dive to the bottom, depositing their eggs directly into the weeds and debris, typically in early spring. Eggs soon hatch, 1-2 weeks after being laid. Backswimmers trap a bubble of air called a plastron along their bodies and under their wings allowing them to survive beneath the surface on their aquatic jaunts. Using aeropneustic respiration the backswimmer absorbs the air through spiracle pores along their bodies directly into their body tissue. This air bubble can be replenished to a degree by fanning their legs to diffuse oxygen from the surrounding water. The air bubble gives backswimmers a unique reflective sheen and should always be a pattern consideration. Mylar and Crystal Chenille are two preferred material choices. Coating patterns with Aqua Seal Epoxy or Epoxy substitutes are other alternatives. Water temperature and the backswimmers activity level dictates dive times. Eventually they must return to the surface to replenish their air supplies. Backswimmers are most vulnerable to predation during these oxygen supply missions as they leave the relative security of the aquatic carpet to return to the surface. This U shaped travel path is crucial to many successful backswimmer presentations. The air bubble is a liability of sorts for backswimmers as they must either grab on to something beneath the surface or be in constant state of motion. As soon as backswimmers stop the buoyant air bubble bobs them to the surface. A tactic backswimmers often use, floating up in head down 30 degree angle, perhaps to obtain a better vantage point on the world below. In recent years foam based patterns used with intermediate and faster sinking lines do a fantastic job of suggesting this trait. Using a series of short 2-4 inch strips and prolonged pauses foam based patterns dart through the water column bobbing upward during the pauses. A series of long pulls and pauses also works well. No matter the presentation choice, be prepared during the pause phase for trout to pound the pattern. Where multiple fly rigs are permitted place a buoyant pattern on the point and traditional weighted patterns on the droppers. This washing line approach, as it was named by its English creators, works wonders in the fall when weed growth is at its peak. The buoyant pattern skims the other patterns just above the weeds reducing the risk of fouling. Newer intermediate tip lines are ideal for this method in the shallows. For deeper reaches clear intermediate or traditional type 2 and 3 sinking lines work well. Backswimmer and water boatman activity often overlaps and it is prudent to offer fish a choice between these two morsels. In the later summer and fall I often have a backswimmer on the point and a smaller boatman on the dropper. It is common to have trout favour the backswimmer for a period then switching to the smaller boatman pattern. Trout seesaw back and forth between the two choices all day long. It is a great approach, throwing the odds in the fly fisher’s favour.